Last time I talked about Millie’s volunteer work in the library and nursing home. When Millie learns about a book she wants to “read,” she listens to it instead. The National Library of Congress offers a free audio book and magazine program through their many regional offices. To find the phone number, check at your local library. The regional office will send a cassette player and tapes following their phone call to determine what kind of books are of interest. If you don’t have a title to request, the caller will suggest a category such as bestsellers, classics, westerns, science fiction, mystery, biographies, sports, and non-fiction. The player is easy to operate and can be kept on indefinite loan as long as one book or magazine is requested per year. Pop the tape in, and turn the on/off button on. A volume button is the only other button. 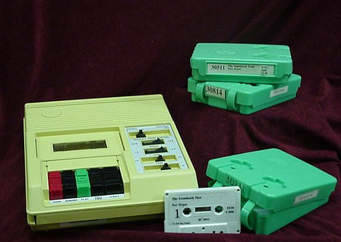 After listening to a tape, simply turn the address card over to return the tape. Millie uses another free service for magazine articles on tapes. Here’s the phone number and website for this free service from Choice Magazine. 1-888-724-6423 and www.choicemagazinelistening.org . The 12-hour quarterly issues consist of articles from a collection of 100 magazines. These work on the Library of Congress cassette players. Again the postage is free to return them. Want to know who died in your community? Some local newspapers have volunteer readers who will read over the phone whatever sections you want to hear. A phone call to the local paper will answer the question whether or not this service is available. If the answer is no, perhaps your phone call will be the trigger to initiate it. Have you ever listened to a book or magazine? Do you have one to recommend?